Over 60 Grades of TOOL STEEL. Tool Steel from PPC Specialty Metals is your best choice for fast accurate tool steel products. Share PPC Specialty Metals, Inc.
*Depend on PPC Specialty Metals for all of your steel requirements. We have a proven record of being a quality steel distributor for over 25 years. With PPC Specialty Metals the product that you receive is the difference between us and our competition. Most suppliers do not take the time to remove the sharp edges from a cut piece of metal. Every order processed by the skilled team at PPC carefully cleans, de-burrs and stencils the grade with painted lettering, quickly visible for positive identification. PPC customers realize and compliment the value of this quality service from PPC Specialty Metals. In addition to the line of heat treating furnaces, PPC has the knowledge and expertise to assist you with any of your heat treat questions! Is there a difference in TOOL STEEL? You will immediately see the difference on every shipment from PPC Specialty Metals and here's how.........we process each order by cleaning and removing any sharp corners. 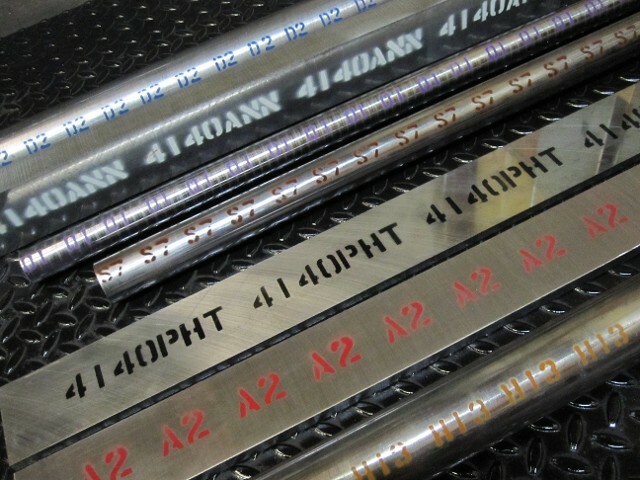 After this, each piece is carefully identified with painted, stenciled lettering down every inch of the bar or piece. What you receive from us is cleaned, de-burred, and stenciled. Our skilled team takes a lot of pride in providing this service and its benefits to our customers. In addition to the standard, common-sized flats and squares, PPC Specialty Metals, Inc., offers in-between sizes in an effort to save you, the customer, valuable machining time. Decarb-free tolerances are approximately .015 to .035 inches oversize in thickness and widths are saw cut oversize, to be finished according to your specific requests. Most orders are shipped within 24 hours. Available for immediate shipment from multiple locations as well as any special sizes can be made to order that can ship within a matter of days. Contact PPC Specialty Metals, Inc., in Monroe, North Carolina, to learn more about our decarb-free flats and squares.